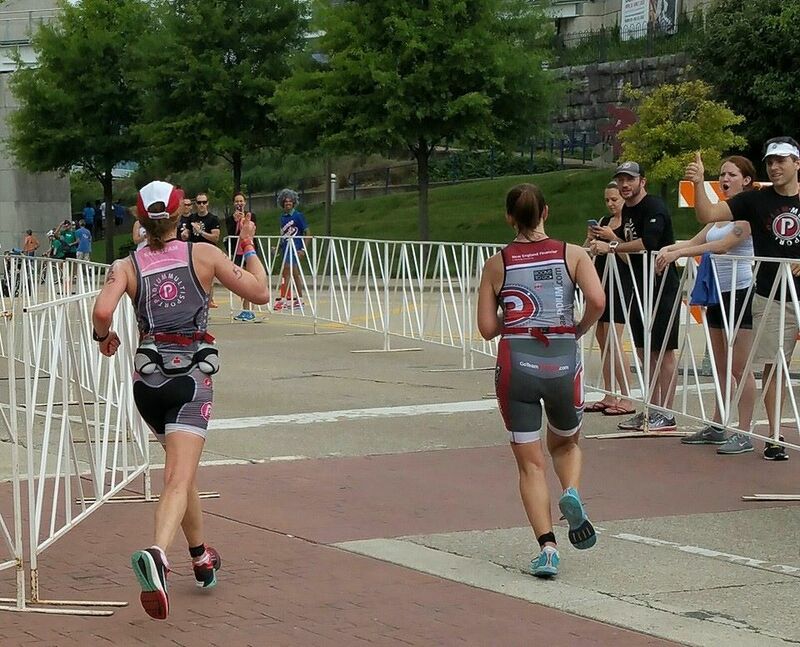 Chattanooga 70.3 is my first race of the season. I was going to do FL 70.3 but instead worked on letting all that I did last year by running on a hamstring injury work its way out. The night before I didn’t sleep fabulously, but I did sleep OK, which is terrific for me. That morning, I warmed up around the hotel while Carlos got ready. As I ran around the hotel I saw people starting to head down to transition. I went back up to the room, and Carlos and I soon headed to transition ourselves. I had lucked out with the Hotel and we were at the Courtyard by Marriott. We could see Ironman Village from our window. It was a luxury that I used to its fullest potential on Race Day morning – heading back to the hotel room after setting up my transition area and before heading to the swim start. 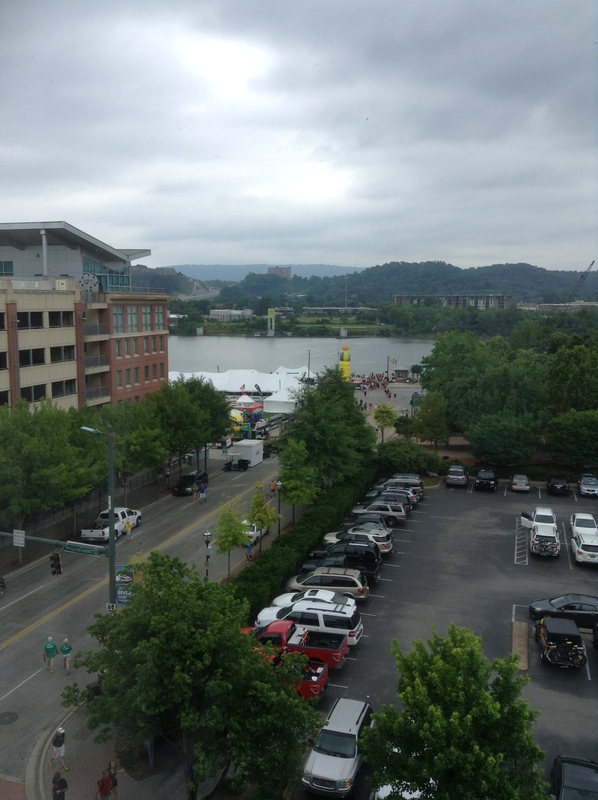 The view from our hotel window – Ironman Village! Next I was on the bus heading to the swim start. I hit the bathrooms (an item I repeat a few times in the morning) and got in line. My plan was to start about 2/3 back. Not because I am slow, but I rather like to chase. I realized I was about 20% back so…I headed back….too late. I ended up being one of the last people to start. I was just a little ahead of all of the relay teams. Dang. Oh well – I saw a few friends also back near me and we chatted. And the person standing behind me in line was terrific – as usual. We chatted, and he even let me run out to the bathroom (and I did the same favor for him). Soon the line was moving. As we snaked to the start I did one last quick run to the bathroom, and back in line. Age groupers started at 7:10. I actually got in the water after 8 am (about 8:03), just a few minutes ahead of the relay teams. We started down the dock. People were just jumping in, with maybe a second or two between others jumping in. No problem. Once we cross the timing mat, our timer started so jumping in quick was important. I started off hard – which I planned to do. For the first 100 yards or so it was hard to catch my breath but I told myself I can handle this, I will be OK. And soon, I was, in a regular stroke and swimming strong. It was a pretty clean swim meaning I didn’t get knocked around much at all. I did swim up on a number of people, and had to swim around a bit, but not haphazardly just and overall it was great. I realized I really like river swims. I love deep water starts (vs beach run in) and river swims are usually a straight line which are terrific for me as I usually swim like a drunken sailor weaving my way around. In a river swim I actually get a fairly decent straight line. This one we did ~ 300 yards upstream before going around a buoy and heading back down river. I loved this swim. Soon I was sighting to come in. I didn’t know the buoy layout until we were approaching the actual start – they didn’t know it when I went to the athlete briefing. But it was a simple layout, and no problems were had by me (or anyone else I could see). I cut over and made my way to the deck. I remember talking about the fact that the pier handles are out past the steps so when stepping up be sure to step in so you don’t fall back down. Mission accomplished and I was running up to transition. I make a habit of running, and taking my wetsuit off as I run until I get to the wetsuit strippers. 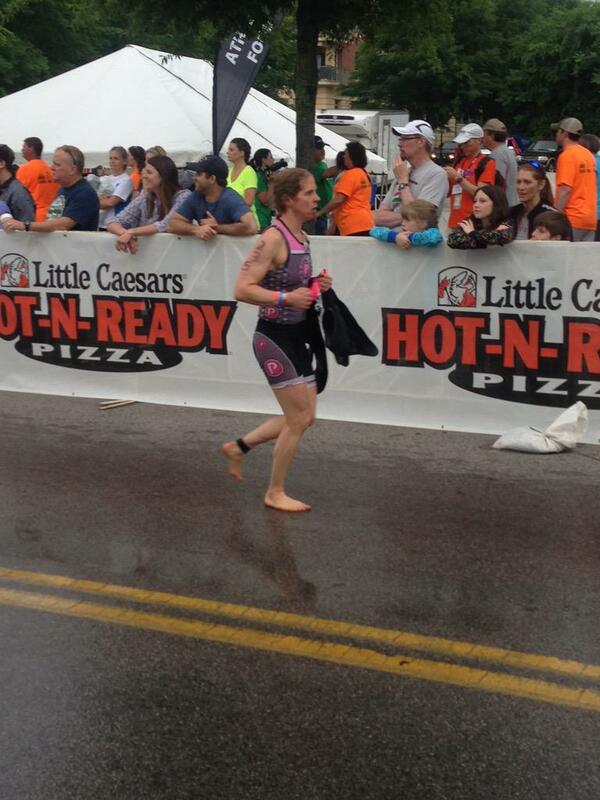 They had my wetsuit off me in a shot, and I was running uphill to transition. It was a long run to my spot. But I didn’t mind as it meant I had a short run with my bike shoes. By the time I got to my spot most bikes were gone. I know it’s all relative, and wasn’t worried. I was ready to ride. As I pushed my bike to the mount line (FINALLY getting the balance to push from the seat and letting it roll forward….it’s been a long time coming!!) it started to rain. Dang. OK. That meant most people in my age group in the front had about 45 minutes at least of dry road to gain some good speed before having to be a little careful. And riding when it starts to rain is just easier instead of starting after it has started raining. Or so I think. I crossed the mount line and hopped on my bike. In the first 3 miles there are a couple of rough train tracks – well marked and we all slowed for them. By that time there were a number of water bottles and other things there. One great part about being one of the last ones in the water – I spent probably 90% of my time on the left passing people. A few (mostly relays) passed me but, I just got to go, and had pretty clear roads. I did get blocked by a few cars and couple of large groups occasionally, but nothing remarkable. Although at one point a small group of us passed a car on the left. I thought to myself “This can’t be legal” but we all did it as the car was stuck behind a slower rider, and the path was clear. Early on I had a man behind me that never passed me (I think). If it wasn’t clear he yelled “left” and people moved and we went on through. I just let him clear the way for about 5 -10 minutes. I looked back to be sure I wasn’t blocking him, but he never passed that I saw. Here’s a bit of ego – I was fully expecting to have to hold myself back – all of my rides I was having to regulate/watch my power, even when I rode the course a few weeks ago. But on this day it never happened. I would look down and my watts were not there. I was annoyed. And frustrated. Eventually I accepted it, and when there were the few points where my power spiked I went with it because I was riding well below where I should be, and didn’t worry about it. I am still trying to figure out what happened. It could have been stress (Carlos and I sold our condo and are packing and have to move out by May 26, and we found a new home, but don’t close on that until June 5), it could have been weather (it was drizzly but the kind of rain that is fun to ride in for the most part). I am not sure – but lots of factors may have come in. I am disappointed with this as I know I can do better. But, I had fun out there, and rode well. And I felt good – just couldn’t get that effort out of my legs. I rode more of a full IM effort than a half IM effort. In fact, I felt like I could go another 56 as I neared the end. I love the course – few turns and lots of rollers – just what I love to ride. I am a bit disappointed I couldn’t get my legs going on the bike. All I can say is that is what drives people back for a next time. I didn’t see any wrecks but heard there were several after the race due to the rain. The volunteers and police on the course were fantastic. About mile 30 BC passed me, and I tried to keep up but her speed and ability to weave through the groups left me behind. I got stuck behind a couple of other vehicles, but kept a steady ride. At about mile 40 I saw Carlos and hollered at him. He is under strict instructions to not tell me where he will be since then I look for him vs focusing on the race. I was well fueled and in fact, had finished my 3rd bottle ahead of schedule (1 bottle per hour and I finished the third one about 20 minutes ahead of time…deliberately as I knew I was coming in to transition). I kept remembering Matthew telling me my body can handle a strong effort…I just have to remember to fuel it. Fuel I did, and I came in feeling good. I came in and decided not to do a flying dismount. I guess my error at Raleigh has made me a bit gun shy. I had a short run to my transition site so I figured it was not a big deal. I was glad that my shoes were not wet after the rain we had out on the bike course. A quick change to running gear and I was off. 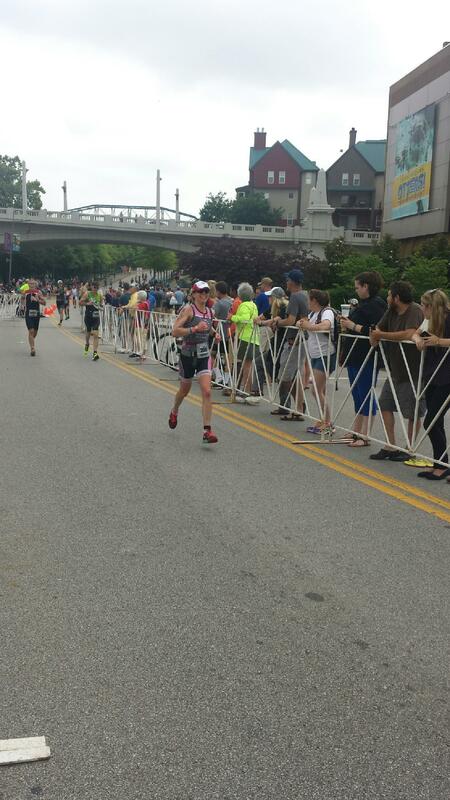 As I left transition I knew to expect an uphill run and see the Podium tent at mile 0.5. 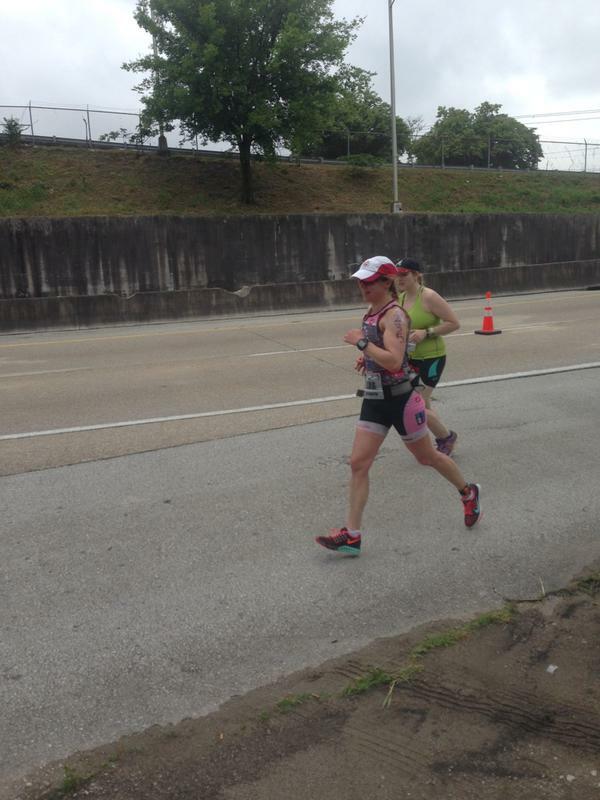 I also saw Mary and Susan near the exit for T2, and saw and heard Maria cheering me out. So by the time I passed the Podium tent I was smiling and feeling strong. I always aim to run strong for half the race. And after that I take it in chunks. OK – it is actually a plan to run strong the entire race, but I just take it in manageable chunks. I saw many friends and teammates from Podium on the course, and loved it. I basically smiled the entire run. My run was faster than I expected. Not fast, but faster than expected. And I enjoyed it completely. Considering I had done little speed work for a while, this was fantastic. I had been so afraid I wouldn’t be strong, and had expected a much slower pace than I did. Matthew had told me – I had too much aerobic fitness to not be strong and to not run well, and I just had to fuel it. Things were starting to come together and dawn on me a couple of weeks before the race, but I was still nervous. I didn’t doubt him….although it sounds like I did….I doubted my body. Well – that will teach me. As I came towards one of the fuel stations I saw my friend Karen working the station, and she CHEERED and propelled me forward and over the bridge. I knew I would get the same reception on lap two. I came to the first big downhill and focused on turnover with my feet – working on keeping momentum downhill. I thought about this with each downhill I encountered. I rounded the bend for lap two smiling, and saw Carlos and went past the Podium tent – sent off by a round of cheers for my second lap. I was ready. I knew I could keep strong to the end, and even give a little more. As I returned from the out-and-back and towards the river walk I saw Maria and she cheered me on to the aid station where Karen was. The last three miles flew by. I actually did go somewhat slower, but not by much, and felt good. I could put in a respectable effort. And soon, like that, I was coming home. I crossed the bridge, and rounded the corner. It was a downhill finish. I was behind a woman in a Podium kit – I figured she was form the North Carolina team (she was – and part of the relay team with two of my Podium teammates from Atlanta). Whether she knew it or not, she helped me pull out a strong finish. And we turned the bend to start downhill we passed the Podium cheering area and I gave Rich a thumbs up as I passed by. And soon I was across the finish line, and looking for Carlos. I didn’t see him, but did head over to the food before heading off to our hotel. It was about 1:15 and we had to be checked out by 2 pm. I wanted a shower before heading home! This race wasn’t where I was racing last year, but with good reason. I have been letting my body heal from racing it last year with an injury which I never really let on to myself it was bad until running was no longer fun. My swim was solid. My bike a bit of a disappointment. I was more prepared to have to hold myself back – not to be unable to hit my power goals. A bit of an ego blow there. The run was not fast, but stronger and faster than I expected, and I am excited by it. To me it means my speed will be there waiting when we are ready to start back in on some earnest speed work. Which thrills me to no end. I had a fantastic time seeing friends on the course and cheering all the way. I couldn’t have smiled more if I tried. It was a good first race of the season. And I am starting to look forward to the rest – especially Louisville in October. I guess if you have read this far, you may be curious how I did. 10th in my Age group with a 5:03:42 finish. I didn’t expect to be that close to 5:00 at all. Which makes my lack of performance on the bike a bit more frustrating. Motivation for next time. I also lost about 2 minutes to the women who placed higher than me in T1 and T2. 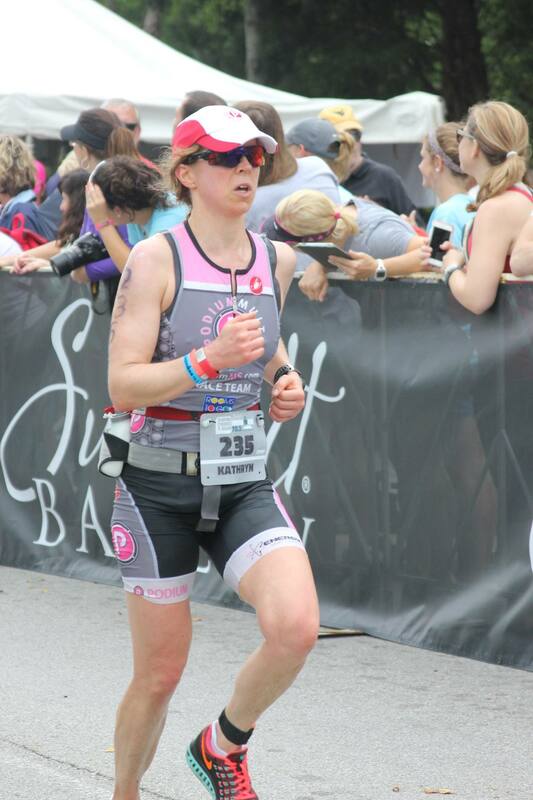 Transition – the 4th sport of triathlon. Bike: 2:39:09 (NP = 160 watts – lowest in a race in a long time; 21.1 mph).